Onward, I say. Time for the next installment in the series, this one covering clippings. 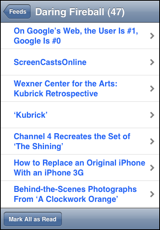 There’s a lot of buzz about clippings in NewsGator Online (and shared items in Google Reader), especially with apps like ReadBurner making them easy to discover. There are similar use cases for clippings in the enterprise. NewsGator Enterprise Server supports two kinds of clippings – personal clippings, and group clippings (which are shared by a group). This video covers personal clippings; group clippings will be coming next time. This entry was posted in newsgator, NGES60 on July 9, 2008 by gregr. As you know, we recently made NewsGator Enterprise Server free for up to 20 users. We’ve had quite a bit of response to this – thanks to everyone who has downloaded and is using it! On a somewhat related note, I’ve decided to make a series of 60-second screencasts demonstrating some of the features of NGES. The first of these is below, on the integrated tagging features. Why 60 seconds? I mean, as someone mentioned to me last week, the shorter the video the harder it is to edit (so true). My thought here is, everyone has time to watch a quick 1-minute video of something cool…but much more than that is tougher. So, I’m going to give the 60-second thing a shot, and we’ll see how it goes. Feedback would be appreciated! The YouTube version is a bit hard to see due to the size and quality; click here for higher quality QuickTime version. This entry was posted in newsgator, NGES60 on July 7, 2008 by gregr. NewsGator Enterprise Server free for 20 users! Ever since we first shipped NewsGator Enterprise Server back in 2005, I’ve had this blog post in the back of my mind. We never had an easy way for folks to actually take a look at the product, and kick the tires for themselves. We had demos, webinars, conferences, and all that…but you couldn’t actually download it and try it for yourself, without buying it (or entering a trial agreement). Well today, all that changes. You can now download a free 20-user version of NewsGator Enterprise Server, install it, and use it! Why would we do such a crazy thing? We want more people to see it. More feedback. More visibility. This product has been extremely successful – our customer list reads like a who’s who of the Fortune 500 – but it’s been primarily deployed in larger installations. But what about smaller companies, or individual departments within companies? This will hopefully remove the barriers involved in trying out these technologies. And in the latter case, we’re confident it will lead to larger sales as the deployment grows beyond the initial 20 users. But for those first 20 folks, it’s free! As in beer. There’s only one catch, and it’s not really a catch. Regular paying customers get dedicated support from our enterprise support team…but if you download the free version, FAQs and community support will be via the forums. That should be ok, though – we really don’t think you’re going to have many problems. One caveat, though – this is a server product, and the installation process will ask you questions about your Active Directory or LDAP configuration and such. If you don’t think you can answer those questions, you might want to find someone to help you install it. 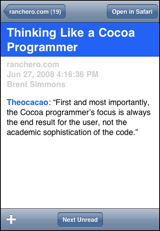 This entry was posted in newsgator on May 20, 2008 by gregr. Vote for the new NewsGator video! The second round of the Enterprise 2.0 Launchpad videos are online, including a new video from NewsGator. We took a different approach than the others – rather than just a screencast, we made a spoof of The Office, showing how NewsGator Social Sites totally rocks all over the status quo. Here’s the voting link: http://launchpad.enterprise2conf.com/. Make me proud! I enjoyed reading Shawn Blanc’s interview with Daniel Jalkut. I had the pleasure of working personally with Daniel when he acquired MarsEdit from us, and got to know him a little bit through that process (although never met in person). That said, I’m still pretty disorganized in this regard, so in all honesty, a typical day for me is to wake up and immediately start working. The hours then surrender to tackling bug fixes, implementing features, responding to customer support inquiries, and trying to squeeze in some socializing via chat and Twitter. Left to my own devices I will work all day and into the night, so I’ve developed some tricks to get myself away from the computer. Forcing myself to take a shower, make lunch, go to the gym, etc., are good ways of punctuating the work with other activities. This is something I hope to write more about in my blog, because as I said, it fascinates me. It’s funny to read this…when NewsGator was just me, and I was still running it all in my house, this was exactly my situation. I found I had to have a “routine” – I would shower in the morning by 11am at the latest, and I would nearly always go have lunch with friends (or at very least get out of the house and eat). Otherwise, I would find myself getting hungry about 3pm, have a quick snack, and the next thing I would know it would be midnight and I’d be hungry again, wondering where the day went. This entry was posted in newsgator on March 3, 2008 by gregr. I’ve noticed a few posts around the web (here’s the latest) expressing a bit of confusion about how NewsGator (and NetNewsWire, FeedDemon, NewsGator Inbox, and NewsGator Go!) subscriber counts are reported. So here’s the skinny. When FeedDemon, NetNewsWire, or NewsGator Inbox are running in stand-alone mode, that is with sync NOT enabled, they will retrieve feeds directly from the source using their own user-agent. When you look in your Feedburner (or other) stats, you’ll see these show up as NetNewsWire, FeedDemon, etc. When NewsGator Online retrieves your feed, it reports total subscriber count as part of the user-agent. It’s retrieving your feed once on behalf of lots of users. Now here’s the part that causes confusion. When FeedDemon, NetNewsWire, or NewsGator Inbox ARE in sync mode (which is the default mode unless turned off), they will retrieve the content from NewsGator Online’s feed store; they will NOT retrieve content from the source. When you look at your Feedburner stats (or whatever you’re using to determine RSS reader distribution), these subscribers will be reported as NewsGator Online users. Related to this, you will never see NewsGator Go! in your stats – this is because Go! only works in sync mode, and always retrieves content through NewsGator Online…and thus subscriber counts are reported as part of the online counts. If a single user uses (say) FeedDemon, Inbox, Go!, and NewsGator Online all synced together, they’ll be reported to you as a single subscriber – not as 4 subscribers. Folks have asked us if we could split out the statistics, to more “accurately” report statistics for the individual client applications. This is actually harder than it sounds, due to the seamless nature of our sync platform. Our system knows if a user is using, say, NetNewsWire and Go! both; however, it’s usually unknown which of those applications a user is going to use to read a specific piece of content in advance. We could report one user for both apps, but this would overstate our subscriber counts. So essentially we compromise, and report them all as NewsGator Online – which is sometimes confusing, but accurately counts users, rather than applications. This entry was posted in newsgator on February 3, 2008 by gregr. NewsGator’s RSS clients are now free! We’ve got a lot of big news today at NewsGator. 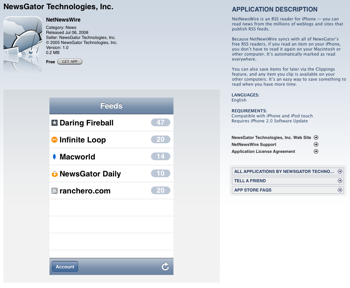 First, we’ve got new releases of our most popular applications: FeedDemon 2.6, NetNewsWire 3.1, Inbox 3.0 (beta), and NewsGator Go! for Windows Mobile 2.0. Each of these is a pretty major release on its own – tons of new features in all of them. But second, every one of those applications is now free! Free as in beer, that is. And add to the free list NewsGator Go! for BlackBerry as well. And not only are they free, but our online services (including synchronization) are now free as well! Not to mention our iPhone reader, HTML mobile reader, and all of the other applications that are part of our online platform. I haven’t been this excited about our consumer products and strategy since we bought FeedDemon and NetNewsWire a couple of years ago. What we’re working to do is to saturate the market with our clients. Anyone who wants a rich experience for consuming content, or anyone who uses multiple computers or devices and wants a best-of-breed experience on each can now use our clients. Using a Mac at home, along with an iPhone? NetNewsWire and our iPhone reader will sync up. Have a PC at the office? 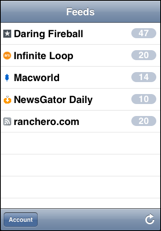 FeedDemon will sync with your other two applications. And they’ll all sync with NewsGator Online. It all just works. First, we’ve found that when we go into an enterprise to sell NewsGator Enterprise Server (NGES) and Social Sites, there are already a ton of people using one of our desktop apps already. The more folks are already using them, the easier it is to sell our server products – especially since these client apps can sync with NGES directly. So, the more the merrier – we’re going to make sure that everyone who wants to use our apps can do so, without having to climb over the hump of having to dig out their credit card. And second, we want to collect “attention” data (actually I like to call this activity data, but everyone else in the world calls it attention) and use it to make everyone’s experience better. If there is a specific feed you love, and you’re constantly emailing its articles to friends or saving articles in your clippings, that’s interesting…and if there are a lot of people doing this, it’s probably a good indicator about the “relevancy” of that content for other users. Similar with individual articles that are getting a lot of attention from users. Basically, by using your data, in combination with aggregate data from other users, we can deliver a better experience for everyone. And that’s a good thing – both for us and for you. We’ve taken some small steps along these lines so far in the client applications – watch over the next few months as these capabilities really start to come into their own, and roll out both in the online reader and continue to evolve in the clients. We’ve talked about APML in the past, and said we’d implement APML export in the clients. We’re going to take that a step further – and implement an endpoint in our online platform where you (and only you!) can always access your personal APML data. That data will be a rollup of all of your activity across all of our clients that you use. We’re also going to make aggregate data available via API. You should start to see all of this start rolling out within the next couple of months. So anyway – this is great news! I’m personally really excited about this, and I’m looking forward to hearing from you. There are a lot of details I didn’t cover here…so here are a couple of links with more info. Q&A – details as to upgrades, refunds, etc. This entry was posted in newsgator on January 9, 2008 by gregr.